As I say in the print edition of this chapter, more art was rejected and redrawn in chapter 3 than the previous two combined. This could have been for a few reasons. One, perhaps I’m improving as an artist and am holding myself to higher standards. Two, maybe I’m becoming a lazier artist and let too many bad drawings get through in the first place. Three, and the point I would argue, I took the time to evaluate and re-evaluate each page (perhaps too often) and realized that thought the drawings were passable and many were even good, the scene needed something different. This happened most toward the end of the book, toward which we roar forward. Including today’s page, we only have six posts left (seven pages in the book; I’ll explain on Thursday). So, with just a few weeks left, we’re closer to the end of the chapter than the beginning at this point. This chapter serves many masters in that it is furthering the story while at the same time putting a major mystery to bed (the mystery of the night where Long John was betrayed by Juan and Jonny). The end of this chapter needed to make an impact. Because of that, some sacrifices were made. Some of the redraws were replacing objectively bad drawings. With this page, however, I was quite pleased with the drawings. 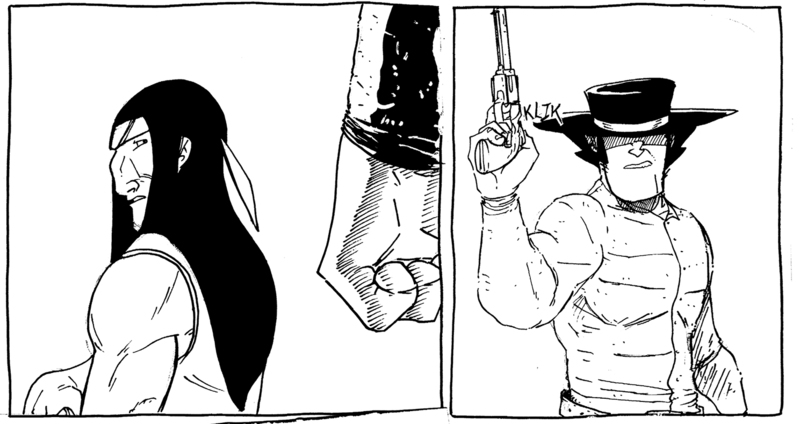 However, the tone the original final two panels set was off. It needed to be clear that Long John was––for the first time in the relationship with the Johns––willing to listen, on a profound level (that is, not in a scheming, technical, “how are we going to infiltrate this bandit camp” kind of way). 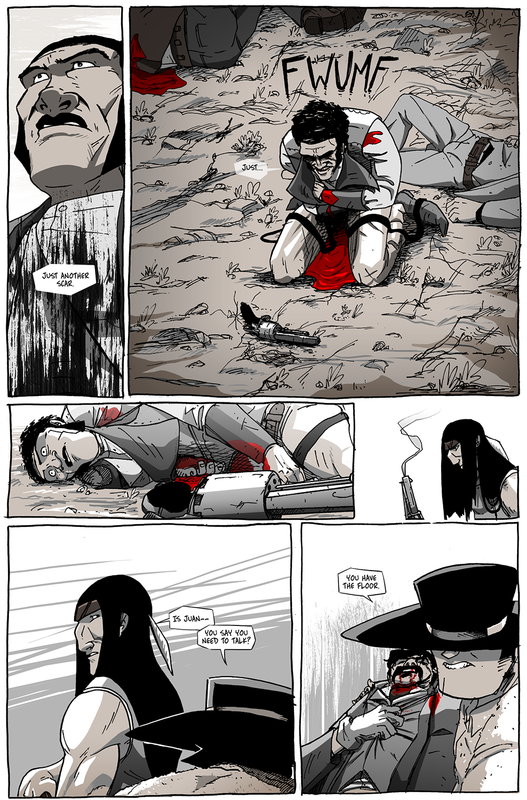 The final two panels in their original form. In the original art, Long John appears hostile and angry, which he surely is. But as the scene became more detailed and the ending became more clear, it’s clear that he’s making a choice and this moment is not an interrogation but a plea: before any more of us die, help me understand why you two tried to kill me, why you felt that was your only option. That said, as much as I liked the original drawings, I’m quite pleased with how well––in my eyes––I nailed the revised tone I was going for. That’s one of the nice things about having a webcomic; this information would otherwise be lost to time when, actually, it’s an important part of the process.